SAVE THE DATE - DECEMBER 7TH! 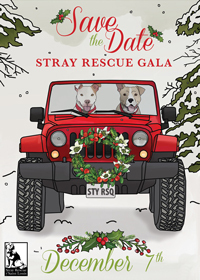 Join us for the most feel-good event of the year, Stray Rescue's Hope for the Holidays Gala! The event will take place at the beautiful Chase Park Plaza, located at 212 Kingshighway Blvd. or by calling the hotel directly 314.633.3000 and mention the "Stray Rescue Gala Room Block" - must book by November 7th. Have an item you would like to donate for our Silent or Live Auction? Click "Donate an Item" below! You also have the unique opportunity to enter to win a 6 or 7-night package to one of five amazing locations (locations TBD). This is your chance to win your dream vacation! Only 125 tickets will be sold! Click "Buy Raffle" below to purchase your tickets before they're gone! There are so many sponsorship opportunities available. Without our sponsors, the Hope for the Holidays Gala would not be possible. Click "Sponsor Event" to find out more! We're also looking for floral shops who are interested in donating centerpieces! Email Andrea for more information at Andrea@strayrescue.org. to this important event? Please click "Donate to Event"